Flash forward 10 years, she will always remember her corsage and you will always remember the way she looked at you when you gave it to her. The gift of a corsage is one part of the gentlemanly process. Finding the right corsage for her black dress can be simple; but planning the colors around your tie color and her lipstick is the making of a memorable moment. You can choose from whimsical designs, luxurious extravagance or just good taste; but it's certain the one corsage that will make her smile is the one you give. Traditional and time tested, a black dress begs for red roses with a small accent of berry drops and leaves. This works well with her red or peach lipstick, and your black-tie tuxedo or black suit. 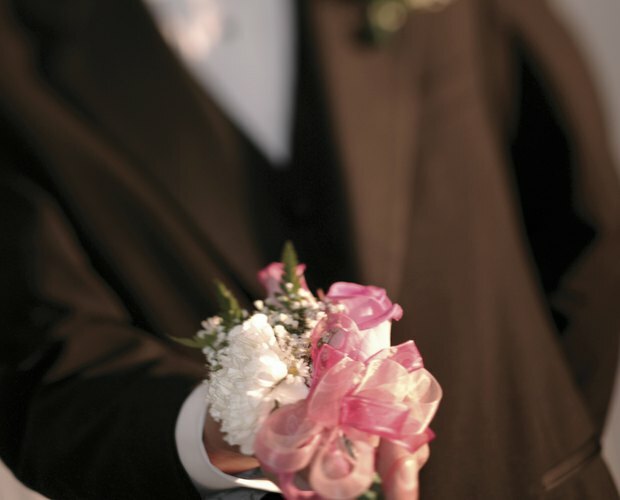 A multiple white rose or orchid corsage can be worn if you wear a black or white tie; it is a safe, elegant choice. A rose as the primary flower with softer, small accents is elegant. A long gown will fit better with roses or white orchids. A small grouping of miniature cymbidium orchids are beautiful on a small body size. One orchid is a dramatic statement for average to large body sizes; but both are very beautiful. An assortment of white flowers is more dramatic with one or two types of flowers. A gardenia corsage exudes a sweet fragrance and has elegant simplicity mixed with a little bit of greenery; it is best for a suit or a dramatic gown. White ranunculus with fluffy, rose-looking petals, mixed with spray roses with dark berries on a white taffeta ribbon is suited for a flowy outfit or short dress. A sophisticated corsage with pink roses and white orchids is stunning. A mixture of pink spray, small roses with white hyacinth, stephanotis and a few ivy vines are a precious combination. This goes well with her pink lipstick, and your black suit and pink tie; or a charcoal, taupe or navy suit. A pink Mokara orchid has a vibrant lilac tone that goes with a navy suit; or a dark green, purple, blue or bright pink tie; or her pink lip color. A purple orchid and blue stock corsage or solo pink cymbidium orchid is a beauty that will be go with your black, navy, gray or taupe suit; or black, bronze, silver or navy tie, which she may want to complement with light pink, berry or natural lips. An orange single-spotted cymbidium with red berries is a festive holiday wristlet for a family member. 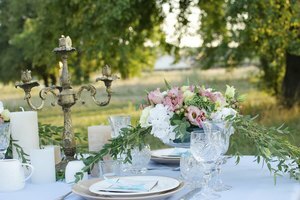 A colorful mix of different flowers is for a less formal event. Carnations are the least formal; daisies are the most youthful; roses look the most traditional; and orchids are the most elegant. Purple orchids and red roses combined looks the most dramatic. Blue iris and purple lilies are dramatic, yet they are also somber flowers used more frequently in funerals. There are purple and blue orchids that work better with black. Peach and orange tones are pretty, but harsh with black unless it's Halloween. White, cream and pink are softer and graceful when matching your black tux or silver tie. Yellow is fresh, and best mixed with cream and green with gold or earth-tone accessories.